Extreame Savings Item! 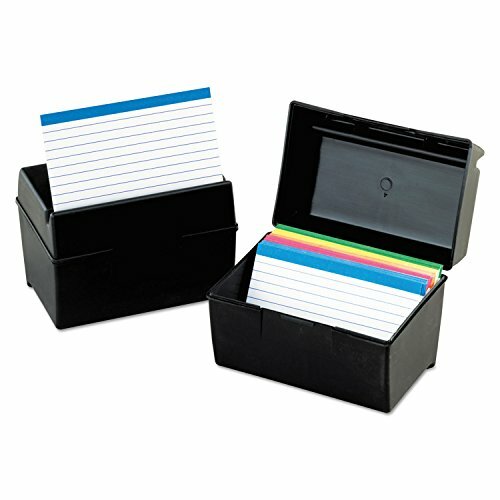 Save 46% on the Oxford 01351 Plastic Index Card File, 300 Capacity, 5 5/8w x 3 5/8d, Black by Oxford at Momiji Studios. MPN: OXF01351. Hurry! Limited time offer. Offer valid only while supplies last. Special groove in top of lid holds a card upright for hands free viewing. Stepped floor design enables easy access to cards (cards sold separately). Special groove in top of lid holds a card upright for hands free viewing. Stepped floor design enables easy access to cards (cards sold separately). Secure snap closure. Special groove in top of lid to hold a card upright. Stepped floor design for easy access.